Resources show up in both Timeline and Resource views on your calendar. For Standalone mode, resources are set up when the Export script runs. For Server-Powered mode, they are defined by a Value List that is attached to the resource field on the data source layout in your solution. (see the attached image). 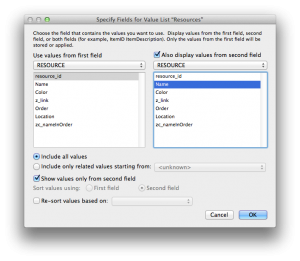 IMPORTANT: In order to show the resource tab in Server-Powered mode, you must create a value list in FileMaker, and attach that value list to the Event Resource Field on the layout you’ve selected in soSIMPLE Calendar Settings (in Data Source). This is the only way to show your resources on your calendar. Starting in soSIMPLE Calendar version 3, resources can be stored either by name or by ID. If they’re by ID, you need to set up your value list on the layout to show the first value by ID and the second value by name. (This is for Server-Powered mode. For Standalone mode, look at the sample advanced export script how to build a key/value variable). Also starting in soSIMPLE version 3, you can have multiple resources assigned to a single event. Whether you use resource names or resource keys, there must be a single field that lists the resources as a multi-key field (a return-delimited list of names or keys). This works well for multi-key relationships. However, in order to to use this option with a resources join table, you need to have a field defined as an Auto-Enter Calculation, and adapt your soSIMPLE Action Script to adjust the join keys.